Welcome back from March Break! Hope you and your family had a safe and enjoyable vacation. Please note that there is no CSPA meeting in March. Our next CSPA meeting will be held on April 27. 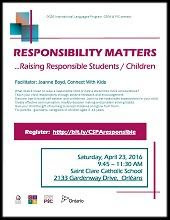 We will have a presentation on Social Emotional Learning initiatives at OCSB. We'll provide the agenda in our April newsletter. Looking forward to seeing everyone then. Wishing everyone a Blessed Easter Season! The Ottawa School Transportation Authority (OSTA) is seeking your input on its proposed School Active Transportation Policy. This policy is scheduled to be presented at OSTA's next public governance meeting onApril 25, 2016. 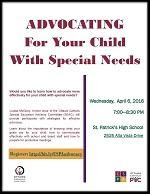 Would you like to learn how to advocate more effectively for your child with special needs? 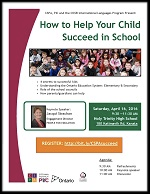 Louise McGoey, former chair of the Ottawa Catholic SEAC (Special Education Advisory Committee), will provide participants with strategies for effective advocacy. NEW DATE: Keeping our fingers crossed that we aren't snowed out! 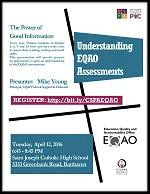 Join us at St. Joseph Catholic HS to gain an understanding of the EQAO assessments. We're excited that People for Education's Jacqui Strachan is back in Ottawa to share some of her insights into the Ontario Education System, parent involvement and the importance of school councils. 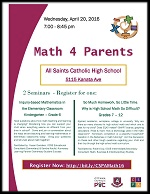 Please join us at All Saints Catholic HS for our very popular Math 4 Parents seminar. Two separate sessions are offered at the same time; one geared for K-Gr 6 and another for Gr 7-12. 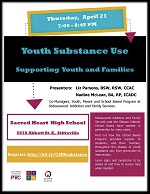 Please join us for a presentation by Rideauwood Addiction & Family Services on Youth Alcohol & Drug Use. Learn the signs and symptoms of alcohol & drug use and how to access help when needed. Find out how the Rideauwood's School Based Program provides support to students, and their families, throughout the phases of youth substance use, from prevention to intervention. What does it mean to raise a responsible child or help a student be more conscientious? Teach your child responsibility through positive feedback and encouragement. Discover tips to boost self-esteem and confidence. Create effective communication, healthy decision-making and problem-solving habits.